Randy Myers is senior technical director of product development at American Roll Form Products, Painesville, OH; www.arfpcorp.com. Metal fabricators and other manufacturers have long dismissed rollforming. Steep upfront costs, high-volume production requirements and absence from collegiate engineering curricula have made the process foreign at best, and cost-prohibitive at worst. Instead, metalformers turn to aluminum extrusions, press-braking and stamping, and miss out on the inline processing and economies of scale that rollforming offers. Given the right applications, rollforming may be the most cost-efficient production method available to metalformers—reducing weight, simplifying production and cutting costs along the entire supply chain. A highly stable and efficient fabrication process, rollforming runs coiled material through a series of roll tooling, gradually forming it into the desired cross-section profile. 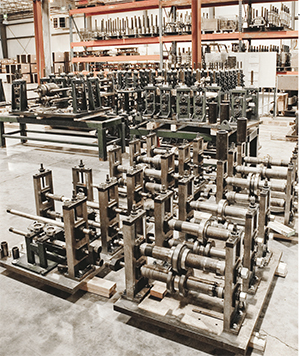 The process efficiently produces parts of any length, fabricates light and strong custom shapes, and eliminates secondary operations through inline processing. Heightened efficiency—Through inline processing and automation, rollforming consolidates multiple manufacturing steps into one efficient operation while reducing excess labor and vendors. High-quality results—Rollforming can manufacture countless shapes from ferrous and nonferrous materials, and form complex linear shapes, rounded or burr-free edges, and uniform cross-section profiles. Cost reductions—Greater production efficiency and high-volume production translate to lower cost per part and economies of scale. And dropping the gauge decreases material, inventory and freight expenses. How do these benefits add up? 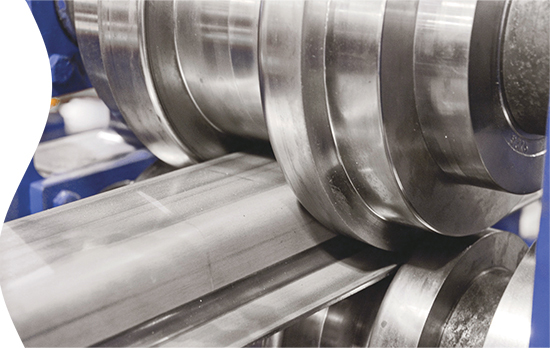 Switching to rollforming may reduce product weight by one-third, resulting in hundreds of thousands of dollars saved annually. But to get the most out of rollforming, heed the advice that follows. A comprehensive analysis of product design identifies where improvements and inefficiencies lie. A metalformer may need to fully redesign a part to optimize it for rollforming, but this upfront time and effort has long-term-payoff potential. Before production begins, carefully evaluate assembly drawings, part geometry and mating components, and identify ways to simplify the product. Eliminate excess notches or multiple bends in a part, and consider ways to reduce the need for fasteners or laser-cut components. Designing for rollforming also presents new opportunities that challenge other production methods. Complex sections often require multiple hits and several production processes to achieve a desired profile. Rollforming often eliminates much of this excess due to its ability to form complex linear shapes and perform secondary operations inline. Rollforming also is well-suited for parts requiring edge conditioning as well as long parts—the process accommodates part lengths beyond 50 ft.
Tooling costs often deter fabricators from traveling the rollforming road, but options exist to reign in this expense. Evaluating how a part’s design can be simplified and optimized for rollforming will reduce costs down the line, and improve efficiency and product quality. Material selection for a new part or product comprises a crucial element of cost control and design integrity. For rollforming to be most effective, opt for light-gauge high-strength low-alloy or structural steel—material whose physical condition can be manipulated during the rollforming process without losing strength. More and more, steel is fabricated via rollforming. Stronger steels, at thinner gauges, translate to less material content in a part while maintaining physical properties and strength. This allows fabricators to heat, cool, melt, mold, bend, punch and stamp the material into the desired profile. For custom shapes, rollform tooling can be engineered to form quality, cost-effective profiles. But escalating tooling costs have deterred manufacturers from the rollforming process. Some manufacturers have turned to partial tooling investment, which ties up capital on the shop floor. This arrangement often requires additional payment or fees if the manufacturer wishes to use another supplier or bring production inhouse. Minimize the tooling’s business impact by amortizing costs, which stabilizes cash flow while gaining the benefit of a high-volume, long-term production solution. Choose a fabricator that allows you to spread out the investment over time, without accruing interest. Although finite-element analysis can identify problem areas with a proposed part and tooling, a prototype provides true proof of concept. If investing in upfront tooling, also invest in prototyping and real-load testing. Prototyping helps justify a tooling investment by verifying the design’s integrity. It also can be tested in the context of its assembly or interaction with other components that compose the final product. Sourcing—Choosing to rollform may require reevaluating your current sourcing relationship, ultimately altering sourcing contracts or finding a new sourcing partner to accommodate higher volumes. An experienced rollforming partner can consult on how the processing switch will impact sourcing needs and lead times. Cash flow—To scale operations according to the high volumes best suited for rollforming, consider all costs associated with raw materials, production time, tooling, assembly, prototyping and shipping, and how these factors will impact cash flow. Demand forecasts—High-volume production presents a smaller margin for error and less production agility. When deciding to rollform, be wary of overproduction. Rollforming is cost-prohibitive for designs with a short lifecycle. Similarly, a highly customized component does not lend itself to rollforming as a single component or as a part that can be produced in mass quantities. Inventory—With a production schedule calling for larger-volume projects, a metalformer may choose to increase parts inventory proportionally. Excess supply can be a headache if not managed properly. When starting to evaluate an inventory-management plan, consider all options. Offsite inventory and management offers one option for higher inventory. Offsite inventory reduces the amount of needed under-roof storage space and the associated labor costs to manage it. Regardless of where inventory is stored, be sure to maintain close tracking. Keeping comprehensive, real-time inventory records delivers full supply-chain transparency and eliminates waste. We have built "Head Stands" for a heat ex-changer machine builder with excellent success. Quick change rolls and speeds up to 1,200 in/sec. material pass through. Yes, a blur of clad aluminum. We also rebuild stands to like new condition in our temperature controlled facility a few miles North of Milwaukee. Send me a note for our testimony.